Checkout Trump telling Fox News that the president is always to blame in the event of a government shutdown. Of course, Barack Obama was president at the time. The Democratic Coalition posted a video clip of Trump doing an interview with Fox News on their Twitter page in response to the federal government shut down. 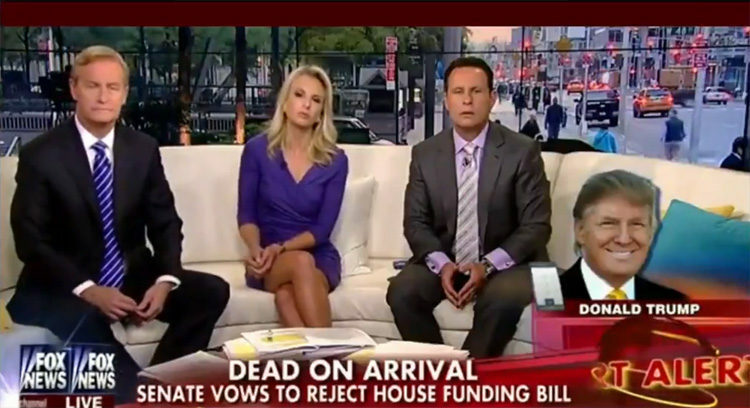 The clip shows Trump being interviewed via telephone on “Fox & Friends” on 30 September 2013, shortly before the government shutdown which ran from 1-17 October 2013. Asked who should be “fired” in the event of a shutdown, Trump responded the president. Vox reported on the details of that 2013 shutdown earlier this week in an article detailing all 18 government shutdowns so far – not including this latest one which began at 12:01am. Ted Cruz, basically. While House Republicans, led by Boehner, had pressured the White House into agreeing to lower levels of discretionary spending, and conservatives in the House led by Rep. Tom Graves (R-GA) demanded that any funding bill delay implementation of Obamacare by a year. It was set to roll out the following year, and conservatives, most vocally led by Cruz and Heritage Action, were desperate to stop it before it gained beneficiaries who could defend it politically. Enough House conservatives got on board with the plan to make it impossible to pass a continuing resolution, and the government shut down. After 17 days, Boehner folded and passed a funding bill that did not defund Obamacare and that most of his caucus opposed. Roughly 850,000 workers, or about 40 percent of the federal workforce, were furloughed.